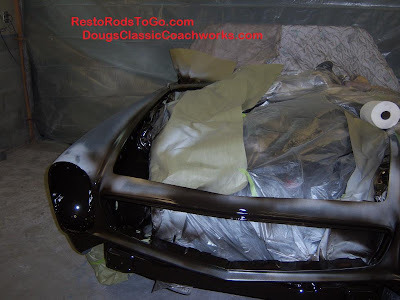 Assembling a 1936 Ford front end is not an easy task. 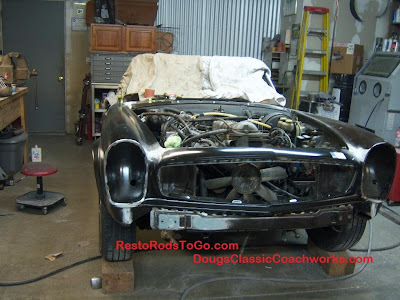 Generally it has to be assembled on the floor and set on the chassis as a unit composed of fenders, front horn panels, grill, inner fenders, radiator, lower nose panel, headlamp mounts, front inner panels, hood latch hooks, oil cloth between the sheet metal, inner grill panel, and stainless fender bead. I'm probably forgetting something here too, just pulling things off the top of my head. 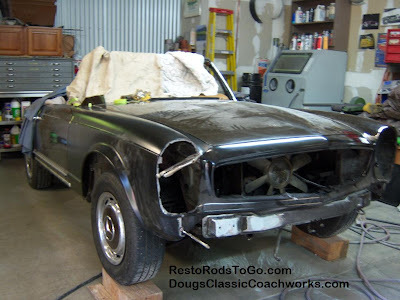 Because the positioning of all the pieces determines the final fit of the hood and whole front end, it is difficult and quite time consuming. 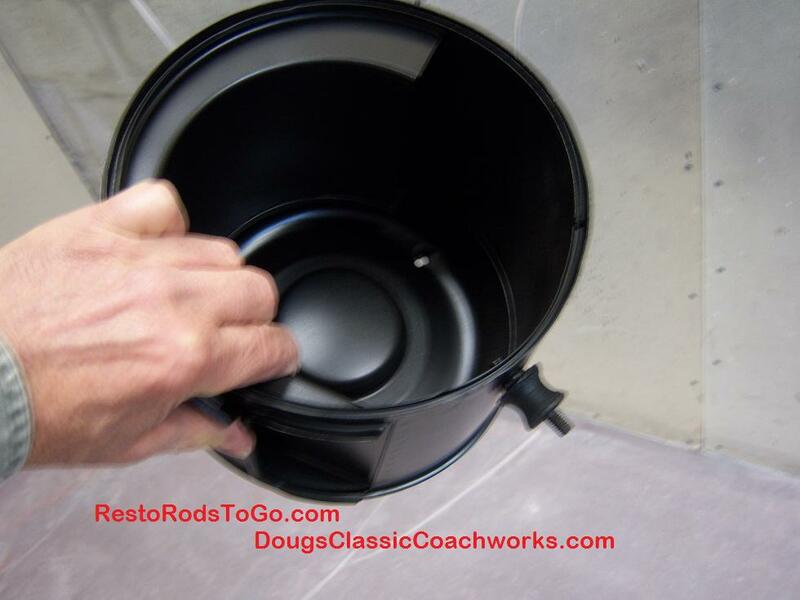 It generally requires a lot of positioning and repositioning, to get that "perfect fit". Now understand I don not believe there is a perfect car out there. It is only perfect to the eyes of most when you get it to a level that is usually attainable with much dedication, expertise and patience. I have developed a Radiator jig to simplify the assembly of the 1936 Ford front sheet metal assembly. Because I have had a lot of experience with them, I finally decided it was well worth the time to fabricate the Radiator jig, rather than fight the assembly process again. In doing so, it has allowed me to assemble and adjust the front sheet metal, on the car, rather than building it on the floor and then putting in on the chassis. 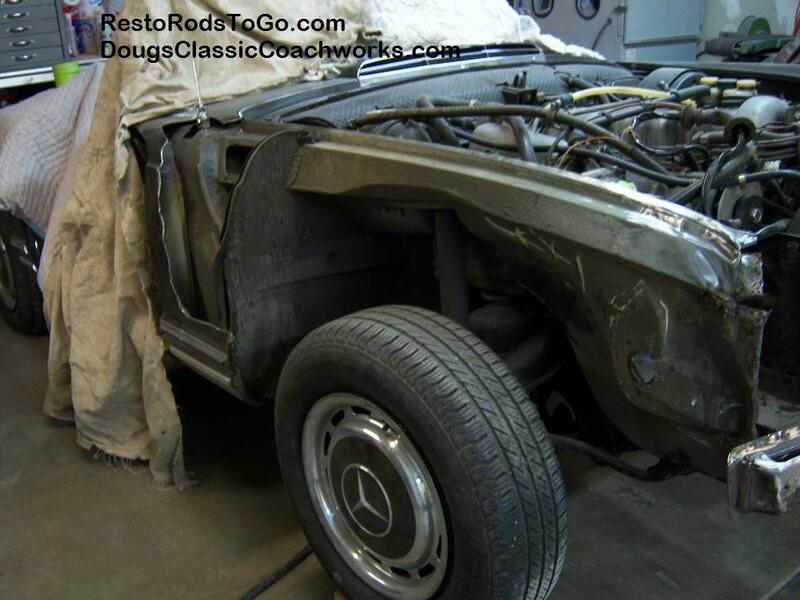 Doug's Classic Coachworks was chosen to do the collision repair on this very nice low mileage 1970 Mercedes Benz 280SL classic car. 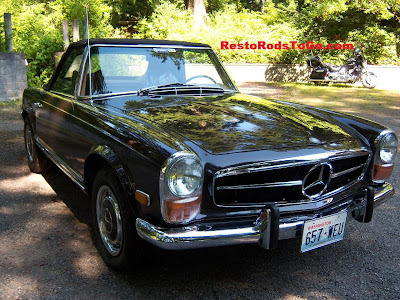 It's fortunate and quite surprising that Mercedes still offers parts for this car. 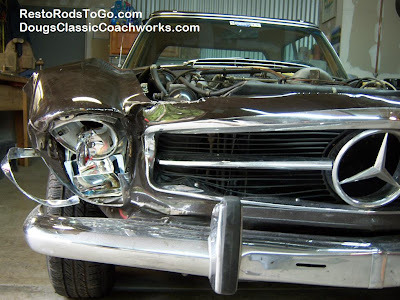 If you have access to a mid early 1980's Mitchel Crash estimating guide, you will find that you can multiply the parts prices by 10 and you'll be very close to current pricing. I was able to locate and borrow a manual from a local shop that has been in business for some time and saved some of the books from back then. I had a subscription back then but those manuals are long gone now. The parts that I was able to get from the Mercedes dealer for this 1970 280SL are basically very nice. 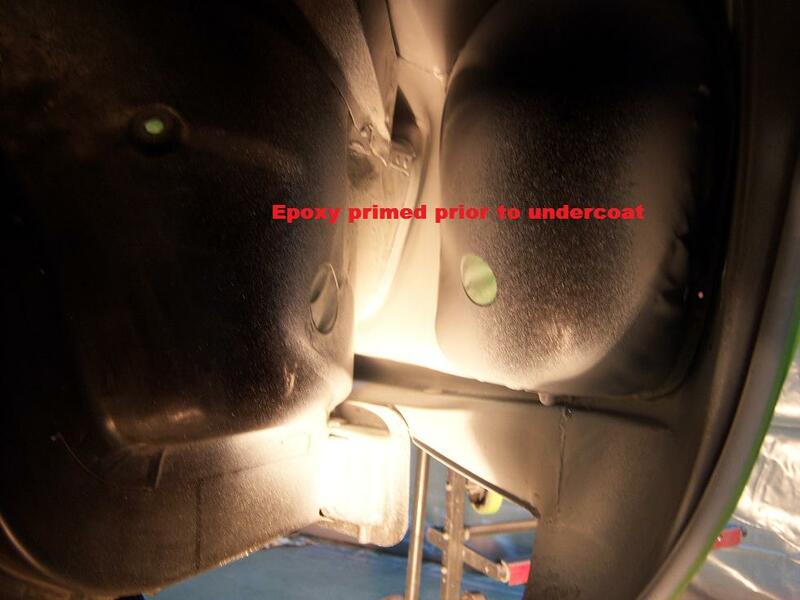 I did however find some substantial defects in the fender, and show that in one of the pictures. I had to pull the spline out of the rear portion of the fender, and separate the two part spline in order to get it to lay down properly. 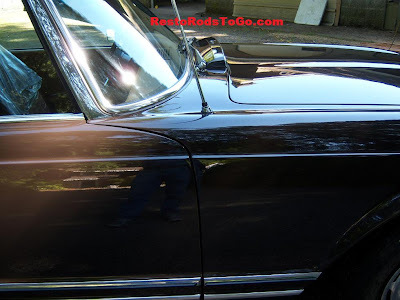 The fender was also chopped off square and too short, which required adding on to it. 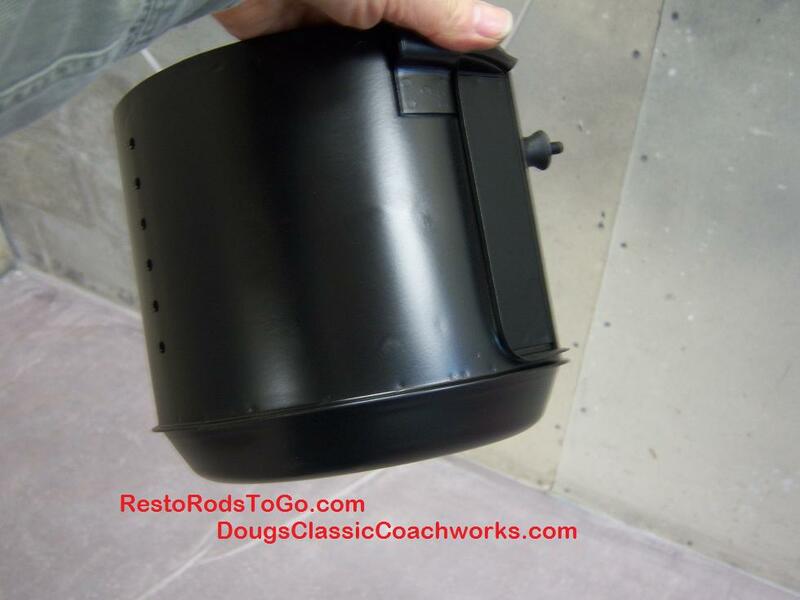 We had to go with a used air cleaner canister because it was unavailable from Mercedes. 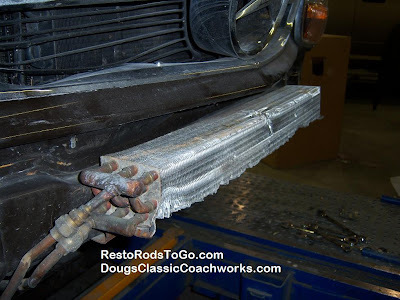 The secondary AC condenser that sits behind the bumper will need repair as it is unavailable. Obviously it would be the first thing to be destroyed in most front end collisions. It is constructed of copper tubing and covered with aluminum tubing and fins. It's a rather unusual design but we will be able to save most of the condenser capacity by sectioning in some new tubing where it is smashed. Undercoating a Mercedes correctly is not done with a can of rubberized undercoat. 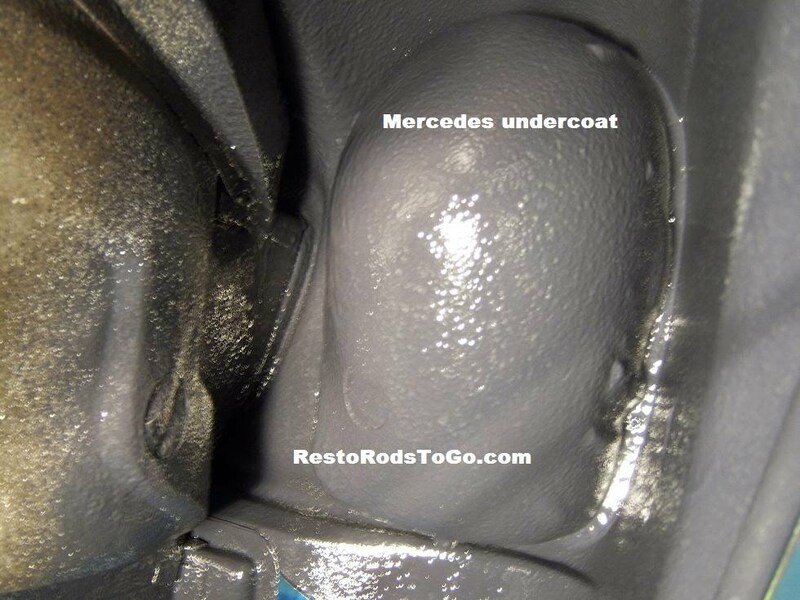 Mercedes used a very dense and heavy undercoating. This material is of waterbase makeup. Consequently, you will need to clean and prep the surface properly and coat the bare metal with epoxy primer so that the bare metal does not rust from the water in the undercoating. Compensation for this procedure is sometimes difficult to get from the insurance companies, however I will not compromise the repair process as a result. A reader had some questions about his newly acquired 1940 Ford Pickup Truck, equipped with a Columbia Two Speed Rear Axle. "I just bought a 1940 Ford pickup that has a Columbia 2 speed rear end and read your article on it. The switch I have is a spring loaded one and that does not seem to be what was used at that time period .I also drained the rear end fluid as I have no idea how old that oil was. My next question is what type of oil goes into that unit? The oil that came out was red in color .One last question. 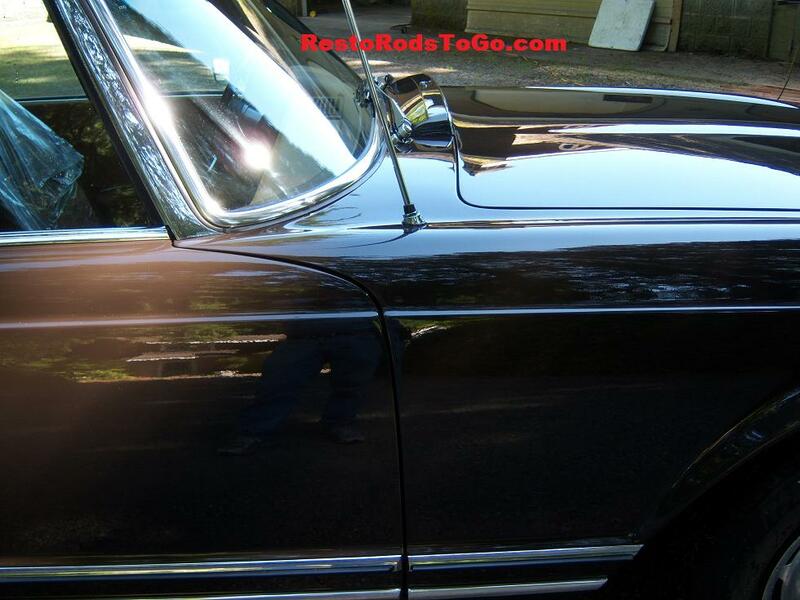 The brake fluid in the old manual calls for Ford brake fluid M3833 ,what type is that in today’s fluid. Thank You for your help." Thanks for your question on the Columbia. Your Columbia uses standard 90 weight gear oil and Dot 3 brake fluid is fine for your truck. 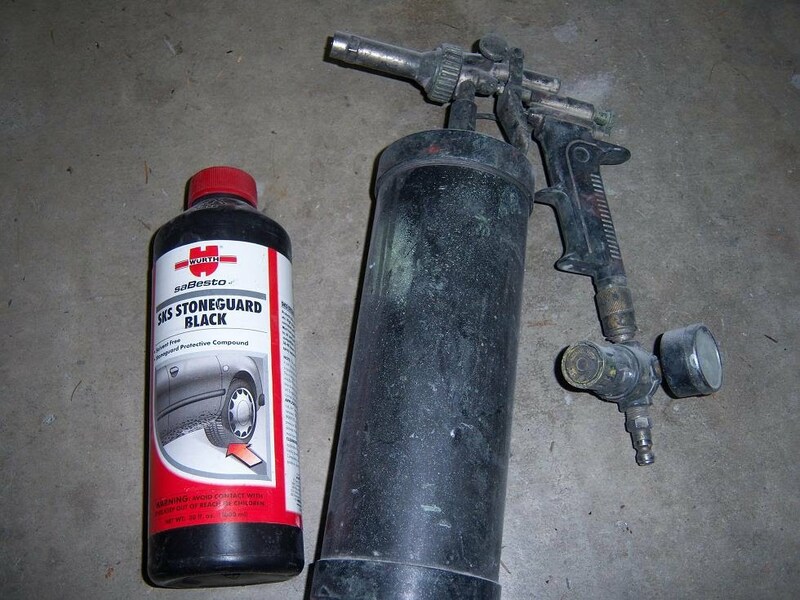 I don't know what that red oil would be that was in your rear end. The spring loaded switch may not be original but as long as it functions to switch the vacuum valve, directing the vacuum to one side and the other of the slave cylinder at the rear axle you should be good to go, provided the rest of the system is up to snuff. "THANK YOU,THANK YOU,THANK YOU. It is sure nice to have someone who can help a new guy out with questions that arise.The knob idea is good,but doing a lot of on line search for parts and info there is a company called Chuck's trucks and CandG that have the original knobs that I found on their web site.Thank You again, Ron"
A reader contacted with a question on how to wire an old turn signal switch. 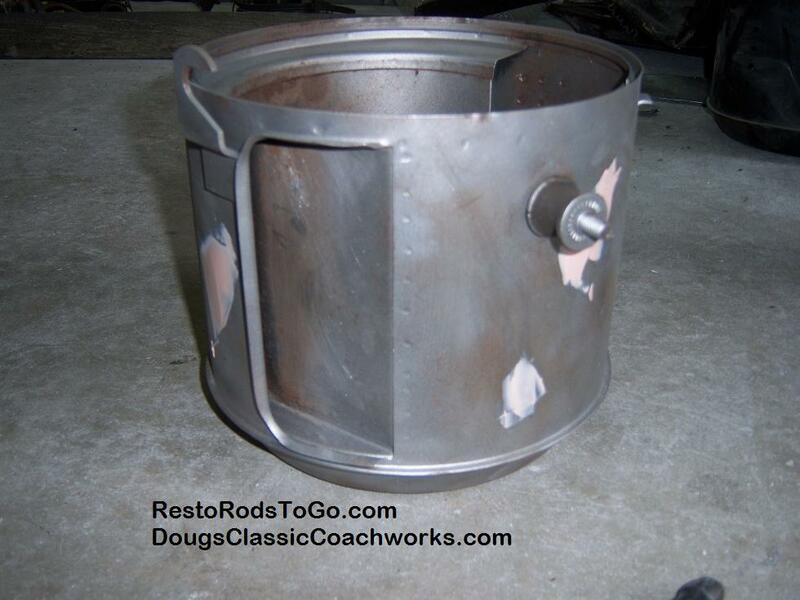 "I have an old Guide 6004 turn signal with the original cloth covered wire. I need to know how to wire this in. the wires are quite old, of course. so they are hard to read the color. But here it goes. Red. White, with red and black striping/stitching. White with just black stitching. Seems to be yellow on the last one. This came with a old 3 post flasher, but it was not connected. Can you please help me? I see you are from the Northwest - so am I . E-mail, or call, please"
Sounds like what you have is a 5 wire unit. The way it is wired, you will need separate lights for your turn signals in the rear. 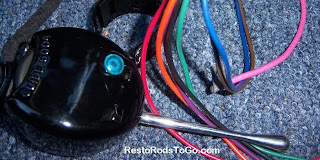 You need a 7 wire unit to use it in an integrated circuitry situation, using your existing brake lights. Not a problem though. That can be fixed with your unit. I can rewire it as a 7 wire unit for you and make sure it is operating correctly. I would mark the wires and include detailed instructions on how to wire it as well. I left my phone number on your voice mail. Hope I can help you. Super 8 and Twin Six Packard, Auburn, 1934 Ford Sedan Delivery 36 Fords 40 Mercury Convertible, Ford Woodie, V16 Touring Cadillac 1948 Town and Country Chrysler, Darrin Body Packard, 1933 Packard Dietrich Body Dual Cowl Phaeton, just to name a few of the fabulous classic cars displayed in Tom Crook's garage. 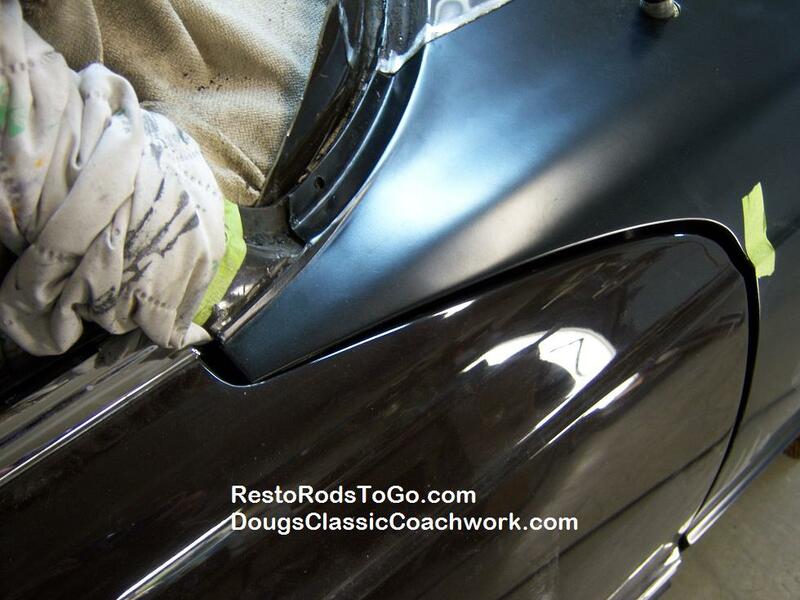 The 33 Packard Dietrich Body Dual cowl was there temporarily from what I heard, as it has recently changed ownership. Owned prior by a gentleman from Mercer Island. I also heard that Tom owns all the rest of the cars in the garage. 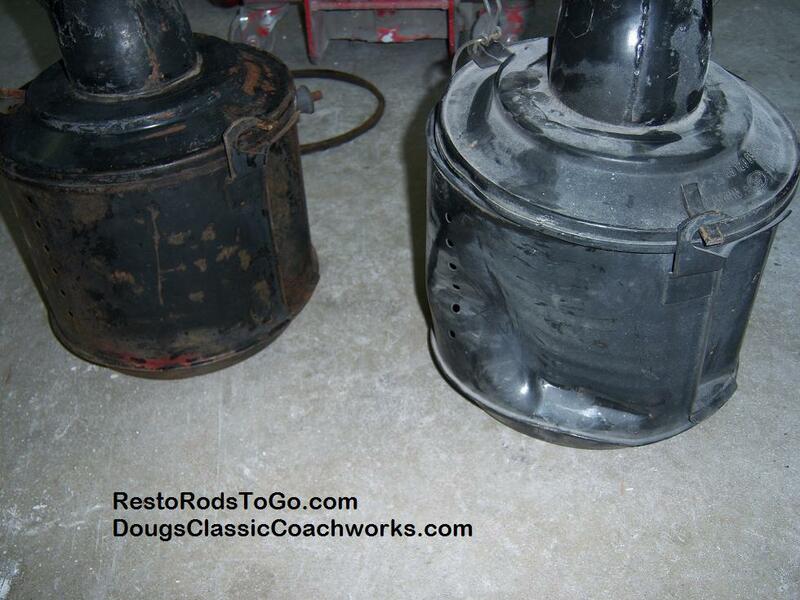 The 33 was a car that I personally had a big part in restoring back in 1991 I believe it a was. 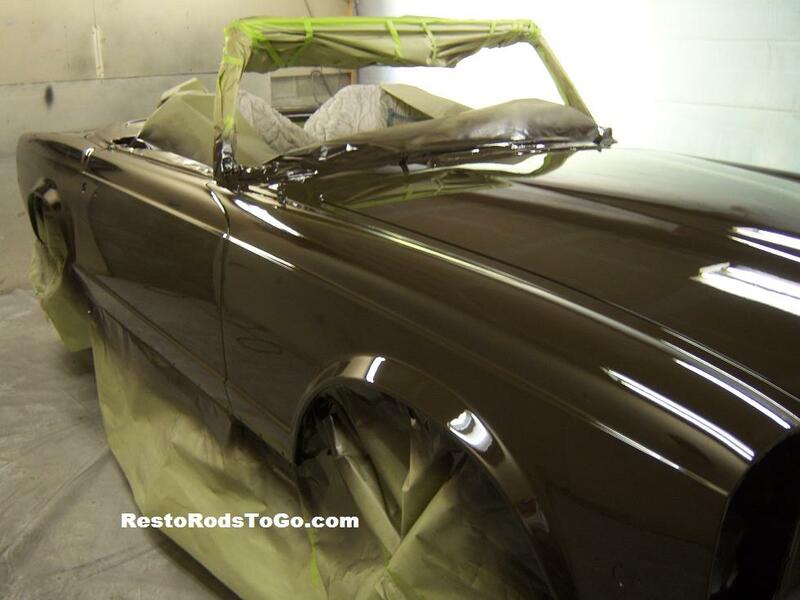 It's the dusty rose colored car with the maroon top. I unfortunately, was unable to attend the show in person as I had prior commitment. Friends however did attend and gave me report on the show.